You will never be bored at Douzou! 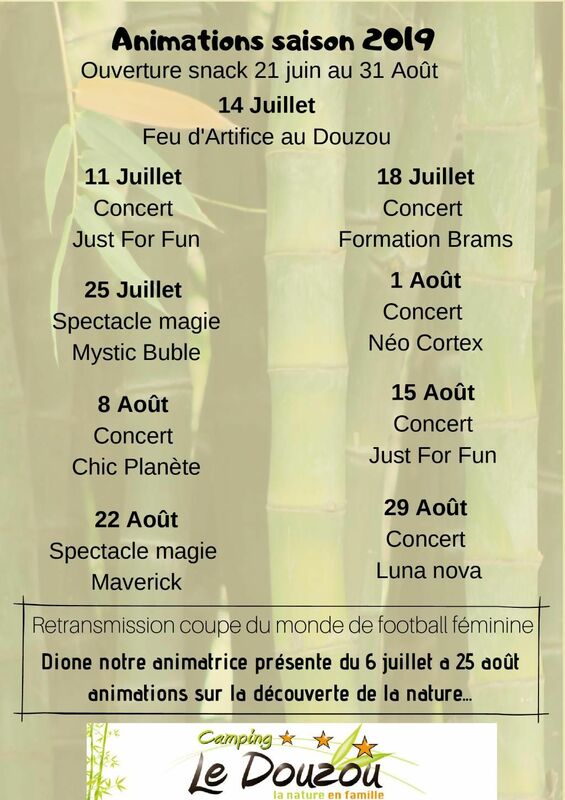 This year again a program rich in animations in our campsite in Périgord. A perfect setting to have fun with our heated pools, sports fields, games, river, evenings shows. 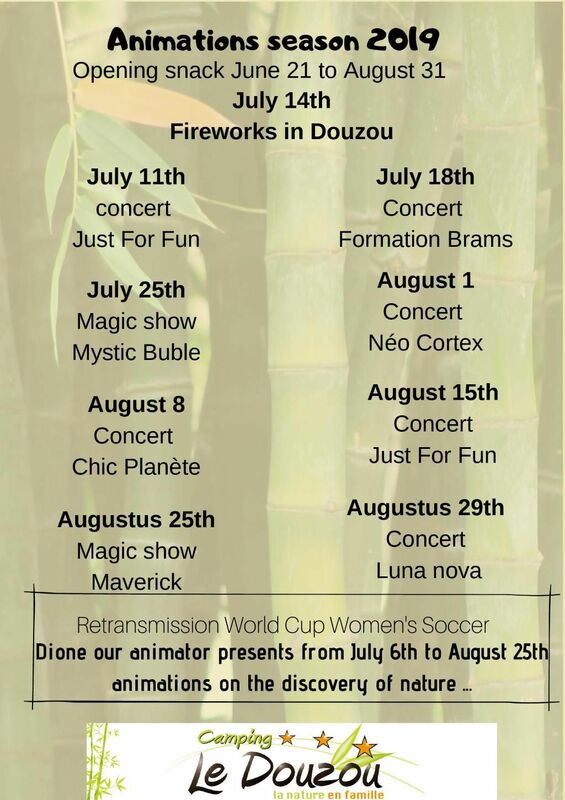 And a novelty this season, our animator will organize many activities on the discovery of nature. A rich program and an animator at your service. As every year, we use a specially trained animator to entertain you. This year, her name is “Dione”. Sportswoman (she is a handball coach) and used to working with children, she brings with her a novelty in the animation program. The activities will be organized around the theme of nature, discovering fauna and flora. It must be said that the situation of our campsite lends itself perfectly. Forest, river and wide open spaces, we are in the heart of the Périgord Noir countryside, away from the city and the traffic of vehicles. But do not worry, we keep the great classics that make every season your happiness. You can participate in our famous football tournaments, ping pong and of course the traditional petanque tournament with its mixed teams (an adult and a child). The most athletic of you will not be left behind with our 3 jogging outings a week, the aquagym session in our small heated swimming pool and the possibility to do in group (minimum number of registrations) mountain bike outings with our Bastien coach. We also think about the youngest of our holidaymakers, with the pony ride, the do-it-yourself, make-up and the famous mini disco. 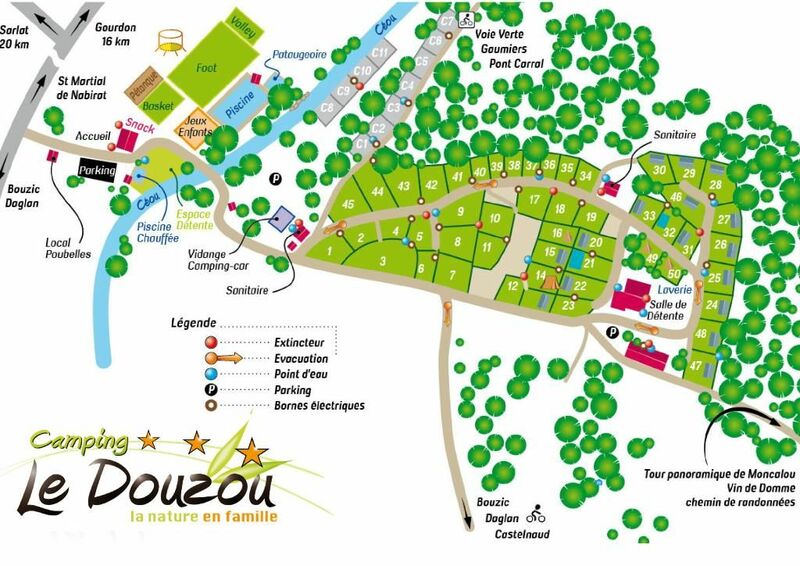 Animated evenings in our campsite in Perigord. We also promise you a show and stars in your eyes. The snackbar will be transformed again into a fan zone with the Women’s World Cup to be held in France. Do not miss July 14, our fireworks, organized by ourselves. Of course, every Tuesday evening of July-August, go to the gourmet night market Bouzic. 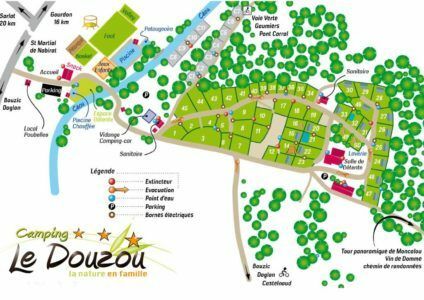 It brings together the best local producers and it is the largest night market in Dordogne. Organized by volunteers, it gathers up to 1200 people at the table.